Wycliffe Associates Press Release - Print On Demand - Bible eludes the persecutors! Please find our April press release focused on the Print On Demand systems. (Orlando, Florida, USA)—Wycliffe Associates, an international organization involving people in the advancement of Bible translation is using technology to keep Bible translators safe as they both translate and print the Scriptures for their own language groups. In areas of the world where the church and Christians are in hiding due to intense persecution, Wycliffe Associates provides compact, high-speed, digital printing systems that can be easily hidden in a safe location. Mother-tongue Bible translators in these areas have been secretly asking for the printing systems, called Print On Demand (POD), which enable them to publish small portions of the Scriptures or an entire Bible discreetly and securely. A few, or many, copies of the Scriptures can then be distributed to churches. Wycliffe Associates’ creation of MAST (Mobilized Assistance Supporting Translation) workshops has generated an increasing demand for the printed Scriptures. MAST, a collaborative, rapid-translation method first piloted by Wycliffe Associates in 2014, drastically reduces translation time. Bible translations that once took 25 to 30 years to complete are now being reduced to a matter of weeks and months. At the first MAST workshop piloted in late 2014, a team of 13 mother-tongue translators drafted half of the New Testament over a two-week period. Currently 30 translation groups worldwide need a POD system, which cost $15,000 each. In addition to helping Bible translators in areas where the church is in hiding, POD systems are helping Bible translators in language groups from remote, desolate areas of the world with no printing facilities for hundreds of miles. The systems also make the printed Scriptures accessible to those living in areas of deep poverty where it would be impossible for local Christians to cover the cost of printing Bibles through traditional methods. Because millions of people around the world still wait to have the Scriptures in the language of their hearts, Wycliffe Associates is working as quickly as it can to see every verse of God’s Word translated into every tongue to speak to every heart. Wycliffe Associates is directly involved with supporting national Bible translators in the areas of technology, training, resources, logistics, networking, expertise, volunteers, discipleship, church planting, and support. Last year, 7,097 Wycliffe Associates staff and volunteers worked to speed Bible translations in 76 countries. For more information, please see www.wycliffeassociates.org. 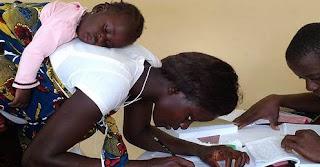 The following is a testimony of a single mother in Ginnea-Bissau, Africa where a translation of the Bible into the Djola – Bayote language is taking place. “My name is Brigite, and I accepted Christ as my Lord less than a year ago. I am 21 years old, and I have a one-year-old daughter. Her name is Ercilia, and she is my great joy. “Being a mother is a great responsibility, and caring for Ercilia requires most of my time. But when I was invited to participate in a Bible translation workshop to help translate the Holy Word into my language, I knew I must do it. “My people, the Djola Bayote, live in Guinea-Bissau in Africa. In our culture, most people believe many gods and spirits exist. They very much need to know about the one true God. So I must translate the Scriptures for them, so they can be changed like I have been changed. But mostly I want to translate God’s Word for my daughter, so she can grow up knowing the truths of the Bible and that God loves her. “The MAST translation workshop was challenging, but it also was a blessing. I took Ercilia with me every day, and she was an extra inspiration. By the end of the workshop, the other nine participants and I had finished translating 22 chapters of the New Testament into the Djola Bayote language. We are very excited about this progress, and we are eager to continue the translation in the next workshop, which will be soon.